The United States Congress designated the Pasayten Wilderness (map) in 1968 and it now has a total of 531,371 acres. All of this wilderness is located in Washington and is managed by the Forest Service. 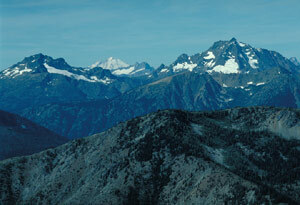 The Pasayten Wilderness is bordered by the Stephen Mather Wilderness to the west. Skirting more than 50 miles of Canada's border and encompassing the crest of the Cascades, this big piece of very wild country is home to the largest population of lynx in the Lower 48. The Wilderness boasts almost 150 peaks over 7,500 feet in elevation, 160 or more bodies of water, and at least as many waterways, some fierce enough to have carved incisive canyons with sheer walls. Rugged ridges in the west flatten into park-like plateaus toward the east, with deep drainages on both sides. Its diverse forest changes from vegetation typical of western Washington (fir, cedar, western hemlock) to growth typical of eastern Washington (fir, pine, larch). Deer, moose, mountain goats, bighorn sheep, the fabled gray wolf, and the intimidating grizzly bear steal through these woods. Snow falls between October and May, and the hardpack may block the high western-side trails sometimes until early August. Eastern-side trails are usually free of snow by early July. Although part of the Wilderness lies in Mount Baker-Snoqualmie National Forest, the largest section (and its management) falls within the boundaries of Okanogan National Forest. More than 600 miles of trails provide access to the Wilderness, many of them deceptively gentle at the start and progressively labor-intensive as they crawl up endless switchbacks into the higher country. The Pacific Crest Trail (PCT) crosses the area north-south for about 32 miles. The Boundary Trail moves north from the southeast corner to ramble near the Canadian border for a total of more than 73 miles (making it the longest route in the Wilderness) before eventually joining the PCT. A Recreation Pass is required at some trailheads accessing the Pasayten Wilderness. Planning to Visit the Pasayten Wilderness? How to follow the seven standard Leave No Trace principles differs in different parts of the country (desert vs. Rocky Mountains). Click on any of the principles listed below to learn more about how they apply in the Pasayten Wilderness.